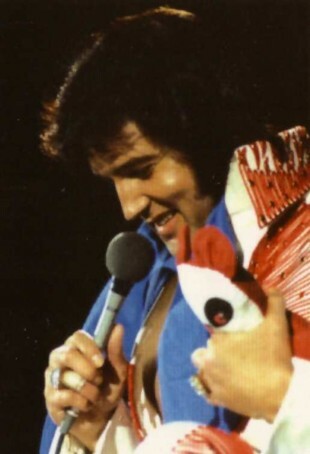 Mid 1975 found Elvis back in good form and having fun on stage. The Dallas June 6th show was featured in the E.A.P silver box-set, while the excellent FTD ‘Dixieland Rocks’ captured the end of Elvis’ April Tour in Murfreesboro. There are also plenty of bootlegs around from this period. Elvis always performed best at Opening & Closing Shows and the opening concerts from his June 75 Tour in Huntsville capture Elvis in sensational form. Slimmed down and looking great in his new ‘Eagle’ jump-suits, Elvis seemed rejuvenated and willing to throw plenty of spontaneous songs into the set-list. 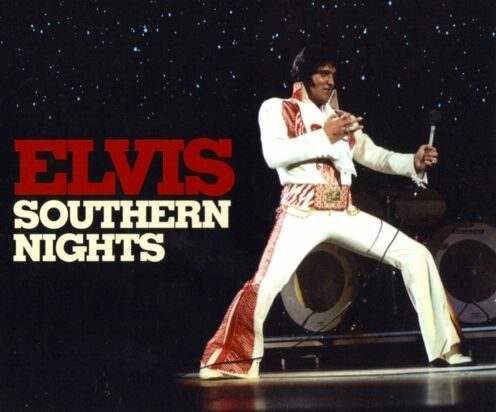 The concept of ‘Southern Nights’ is to focus on Elvis’ wide repertoire at the time, compiling all these spontaneous tracks into an ‘alternate’ concert. FTD have always said that they hoped to fully document every Elvis Tour or Season but this new concept of a complementary ‘highlights’ CD to the May 6th 1975 ‘Dixieland Rocks’ concert is a great idea. The three Keith Alverson cover photos also capture the vibe perfectly and the design is one of FTD’s best. While most of these tracks are of course familiar, one has to realise that many of these songs were only sung once during this tour (see below for list) and this compilation captures their uniqueness & the spontaneity of this tour. The core of ‘Southern Nights’ however is the 12 tracks from the sensational Huntsville Opening concerts. As The Huntsville Times reported.. .
Elvis Extravaganza Shows. ‘Swivel Hips’ is still on Top. If you were there, you can understand that trying to tell the experience in words is like trying to ad lib a volcano. Presley seemed to like opening a tour here; he played for laughs, seemed at ease and you could see there was no doubt in his mind that the crowd was getting what it paid for. Listen to Presley sing ‘The Wonder of You’ and you will get an idea of why grown women forget that station wagon, garage and patio and hurl their pant-suited bodies like kamikazes at the security guards! The CD appropriately starts with Elvis suggesting to the band, "Ok, The first record I made, ‘That’s All Right, Mama". Unfortunately the first three songs from Atlanta in April have a weak audio mix with Glen Hardin’s piano too prominent and very little rhythm section. However the tracks are rarities of the time. ‘That’s All Right’ has an energetic "One more time" ending, and listen for Elvis getting up to speed actually saying @1:20 "change gear"! Also check out Elvis with a knowing laugh @0:33 singing the alternate, "Son that girl you’re fooling with, she ain’t no good to screw". From the same show we get ‘It’s Now Or Never’ (the mix is almost a-capella with Elvis, backing singers & piano alone!) and ‘Help Me’. Jerry Scheff returned to the TCB Band in April 1975 and his playing is nice & prominent on the cool ‘Steamroller Blues’ that follows, leading into a very delightful and un-listed ‘Mickey Mouse March’. In fact one of the cutest points of this CD is the surprise bonus tracks, and there are several! It is worth noting that the majority of the tracks come from reel-2-reel soundboard tapes and are of much better audio quality than other concert releases taken from cassette like ‘It’s Midnight’ or ‘Taking Tahoe Tonight.’ And from Track 5 (The Huntsville concerts) the audio quality is vastly improved and as good as ‘Dixieland Rocks’ – so crank it up & enjoy the ride! Elvis even explains that they are deviating from the set-list "We’re supposed to do ‘Burning Love’ in this spot but instead I’m going to do ‘Heartbreak Hotel’, OK?" Surprisingly this was the only time Elvis sang this standard in the whole tour. A fine version from the afternoon show and as Elvis notes, "You’ll be so sweaty, you could die"! Even more of a shock to the band would be Elvis’ request for ‘Release Me’, a song that he hadn’t featured in concert since March 1974. As Elvis says, "Do we know ‘Please Release Me’? OK, well let’s wing it!" At a slower tempo Elvis really gets into it adding, "sing the song" and creating a cool & measured version. For the life of me I cannot think why FTD included Elvis’ embarrassing attempts at ‘Burning Love’ next (not listed). I know it demonstrates the spontaneity of the shows but it is just plain embarrassing that Elvis has to ask Estelle of The Sweet Inspirations for the lyrics. This is the stuff tabloid journalists love to use to denigrate Elvis. Perhaps Ernst added it for historical value as it shows that, even though Elvis was back & performing well, everything was not as good as it should be. Thankfully, however, Elvis does save the day (just!) by going for a rockin’ ‘Polk Salad Annie’ instead, letting Jerry & James workout. ‘I’ll Remember You’ one of the CD’s highlights follows with including an added "Alfie"! A beautifully sincere version, Elvis seems to be singing it directly to you. With a delicious falsetto towards the start Elvis says to an enthusiastic fan in the crowd, "It’s Ok", and with Elvis as warm as this it certainly is. ‘Bridge Over Troubled Water’, from Mobile is next and is a fabulous & tender version. Just listen out for Elvis’ total involvement, with his humming of the piano scale, as well as @2.40 his emphasis of, "Lord, Lord, lay me down". Next surprise bonus is Elvis in Houston, Texas saying, "This next song is a song we had out about 2 years ago" and then singing the first 2 lines of "The Eyes Of Texas"! And it’s great that the band can join in so quickly! This takes him to a heartfelt (& rare) ‘Trying To Get To You’ and a powerful ‘You Gave Me A Mountain’. Unfortunately ‘Help Me Make It Though The Night’ again suffers from muffled audio but it’s interesting for being yet another ‘off-the-cuff’ song although it’s a very short version. The sound improves again with ‘Fairytale’ from the June 10th Memphis Closing Show. Promoting his new album Elvis says, "We have out a new album it’s called ‘Elvis Today’, or Yesterday, whatever - or Tomorrow!" This was the only time the track was sung on the May/June Tour and is another highlight, taken at a much faster pace than at Murfreesboro. This gives it a better feel and Elvis adds the unusual lyric, "You use me, you abuse me, and you never seem to need me"! Another treat is Elvis’ spontaneous version Hank William’s ‘Jambalaya’, because he was in Louisiana. An official "new" Elvis song at last released to the mainstream. And although only 30 seconds long, if you don’t already have this song you are in for a silly treat. The next 3 tracks, from Macon in the earlier April Tour, suffer from poorer audio but are obviously included for the powerful trilogy of ‘Big Boss Man’, ‘It’s Midnight’ and ‘Promised Land’. It is odd that Kathy Westmoreland’s rather dominant vocal shows a clarity that is actually needed for the whole band! ‘Promised Land’ in particular suffers from the lack of rhythm section. Back in Huntsville once again for the next 4 tracks and the delicious one-off of the Trouble/T.R.O.U.B.L.E combination. Elvis announces, "We have a new record out, that has been out 2 or 3 weeks now, that’s called, T.R.O.U.B.L.E." and then launches into a spontaneous King Creole ‘Trouble’! What a fabulous moment, it sure surprises the band and is a fabulous gem - & don’t you wish you had been there! It’s a shame that Elvis doesn’t actually remember the second verse & so pushes straight into the funky 1975 single of ‘T.R.O.U.B.L.E’. Unlike ‘Dixieland Rocks’, from 3 weeks earlier, he fluffs a few lyrics but we forgive him. Elvis does a nice intro to a fine ‘Hawaiian Wedding Song’ saying, "I gotta get in the mood, you know. I don’t wanna’ smile like a mule in a briar patch!" and follows with a one-off (but average) ‘Blue Suede Shoes’. ‘For The Good Times’ was also extremely rare, performed as Elvis says, "Because JD likes that." Elvis’ vibrato creates a very tender version - and I cannot recall Elvis performing this song since 1972! Boy, that must have surprised the band! With the orchestra obviously hanging back this makes it another treat. Two more great Huntsville tracks round off the CD and are both real highlights. Elvis performs a wonderful, powerful, slow-tempo version of ‘I Can’t Stop Loving You’ and a sensational one-off of ‘I’m Leaving’. Elvis is particular about ‘I’m Leaving’ saying, "I’d like to do a song we did about 2 years ago" & instructing the sounds engineers to correctly adjust the audio mix. Compared to the two official 1974 versions on ‘Live In Las Vegas’ and ‘It’s Midnight’ this is in sensational quality. ‘I’m Leaving’ fades out with Elvis saying, "You’re a fantastic audience. Until we see you again, God bless you & be careful going home" but disappointingly it is not followed by the obvious ‘Can’t Help Falling In Love’ finale. Maybe Ernst decided against this so that he couldn’t be accused of "faking" a complete concert, but the song is badly missed. With Southern Nights also missing the 2001 intro this is easy to fix up. Simply add the intros & outros from your ‘Dixieland Rock’ CD (and perhaps omit the Burning Love embarrassment) to create a sensational "alternate" complete 1975 ‘Elvis Concert’. You know you'll love it! Verdict: If you are a little bored with Elvis’ standard set-list of See See Rider/I Got A Woman/Amen/Love Me then this is the CD for you! Southern Nights is an invigorating selection of Elvis at his best in 1975, having fun & throwing random song selections at the band. If FTD want to continue this theme of a complete concert plus a follow-up CD of other highlights, then I’m all for it. This is a refreshing change & a great idea. Top & tail it with Elvis’ concert intro & outro and you’ll find it hard to resist. If you forgive the variable audio quality at points, which can’t be helped due to the focus on Elvis' wide repertoire across 12 different concerts, then this is another FTD gem. Recorded live on tour 1975. MORE EIN relevant reviews and information for 1974, 1975.